From students chatting with their friends in Skype or Facebook to big corporate business men having a video chat conference, telepresence has evolved in a way that it is now incorporated into our daily lives. So much so, in fact, that people now use telepresence robots to remotely be where they want to. They could attend events like meetings even though they are not physically there. These kinds of robot are great and all, but they can’t actually help people with physical and collaborative tasks and even though your telepresence robot has arms, its processes are limited. In lieu of this, roboticists from Keio University in Japan developed a new kind of telepresence robot that allows you to remotely inhabit the body of another person and assist them with physical tasks. Called “Fusion” by the Keio researchers, this robot lives on the person’s back, allowing you to see what they see, and with its pair of arms you can show the person how a specific task is done, or move their own limbs entirely. The operator uses off-the-shelf HMD(VR head mounted device) which enables the access to the surrogate body. 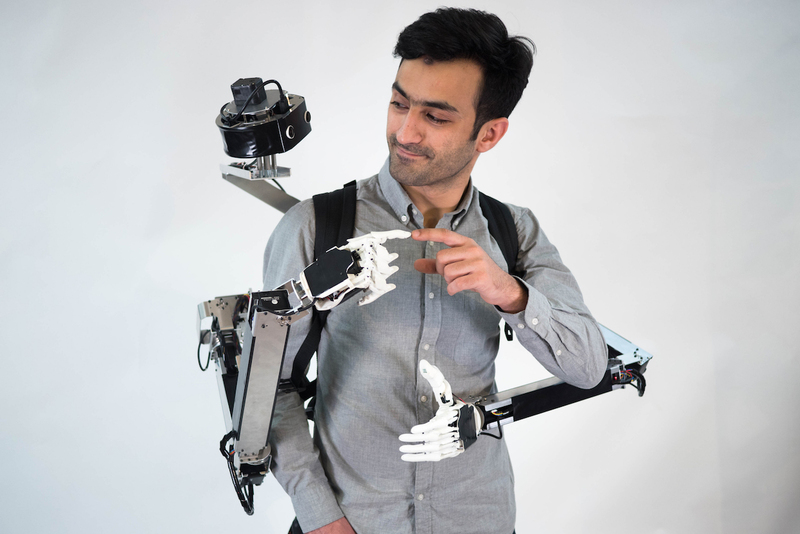 The surrogate mounts a backpack that consists of three axes robotic head with stereo vision and binaural audio, and two anthropomorphic robotic arms (six degrees of freedom) with removable hands. With these robots, helping others with physical tasks would be so much easier. The operator doesn’t have to worry about the hassles of commuting, and in just a push of a button, you can help your far away client/friend at the safety of your own home.